Let’s get this out of the way. Rhino Hunt Club is a high fence, paid hunt club in Northwest Michigan. And it’s awesome. 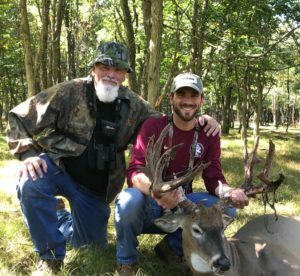 I recently had the opportunity to hunt the big bucks that roam the place and I left awestruck and brought home the buck of a lifetime. I can’t wait to go back. After an 1100 mile road trip, we arrived in Custer, Michigan shortly after lunch on a Friday and made our way out of town and down a two lane road lined with apple trees and windmills. We took a right onto a gravel path and the big gates that led up to the lodge opened up to reveal a hunting land like I’d never seen. 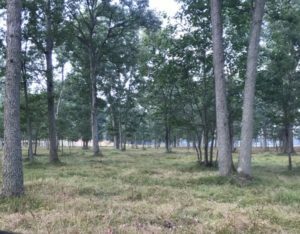 Beautiful rolling hills gave way to hardwoods and foodplots. We eased past a couple of barns and up to a rustic lodge nestled amongst the oaks with a feeder in the front yard. Just my style. When we got out of the truck, our guide Mark and the owner, Brian greeted us at the front door with a big smile and a cold drink. Homemade cookies waited in the kitchen and the smell of something in the crockpot filled our nostrils. Yeah, this place fits me just right. We talked about our drive, picked out our bedrooms and dropped our gear. And then the fun began. Spread out on a kitchen table were color photographs of big bucks they’d watched grow over the summer. Non typicals, typicals, a little of both. Whatever your fancy, they were roaming the woods just outside the front door. We made a little more small talk, but we were all itching to get in the stand. So, we donned our gear, grabbed our binoculars and guns and loaded up on the Ranger. One of my favorite parts about the trip was spending the time with my dad. 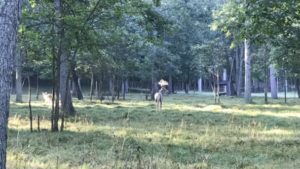 We had the opportunity to share a stand all weekend and watch big deer together – marveling at their size and the sheer number of animals we were seeing. Our guide Mark placed us in a stand he called “The Oaks”. The box stand was situated in an oak flat with hundreds of acorn-dropping trees surrounded by foodplots. Because the acorn crop was so plentiful, the deer were spending a lot of time there, eating nuts the size of a pecan. We settled in and watched the Ranger ease out of sight. But we wouldn’t have to wait long. Within 20 minutes, we started seeing deer. Lots of them. I didn’t count, but I would guess we saw 100 deer that first afternoon, including at least 20 different big bucks. We watched smaller bucks spar, yearlings play and big bucks browse. By dark, we had seen more in one afternoon than we’d see all year back home. Although none of us pulled the trigger that first afternoon, we could have. But why drive so far just to shoot on the first night? We’d surely have a chance again the next morning and my dad and I decided we wanted to go right back to The Oaks again. That night I called home and told my wife Ali about our afternoon hunt. Evidently, she could hear the excitement in my voice because she said I sounded like a kid on Christmas Eve. I told her I was so excited that I couldn’t wait to get to bed so the morning would come faster. Yep, a “kid on Christmas Eve”. That sounds about right. Although there are ALOT of deer in those Michigan woods, we found that they act ALOT like the deer back home. Most deer hunters will tell you that a particular tract or stand is better in the morning or afternoon. Sometimes that depends on wind, food, etc. The Oaks were no exception. The first morning hunt was another incredible experience, but not quite the same as the first afternoon. We saw PLENTY of deer and several big bucks, but there was an obvious difference between the afternoons and mornings. Mark had warned us that the morning hunt in The Oaks might not be as fruitful as the afternoon, but after our first experience there, we were scared to move. The others hunting with us had seen plenty of deer that first hunt, but not as much as we had. As our stomachs started to growl about 9:30, Mark pulled up in the Ranger and took us back to the lodge where biscuits and gravy were waiting. We filled our bellies and made the call to get back into the woods as soon as possible. The Big Ten – 179 2/8″ and 287 pounds. Around 11:00, we decided to make our way back to the woods – after all, we were here to hunt and spend time together, not watch football! And even though the lodge is equipped with a big screen television, all we wanted to watch were the big deer just outside those lodge walls. So, we loaded back up and took Mark’s advice. We moved stand locations and settled in amongst the pines along the edge of another hardwood thicket. And again, it didn’t take long to start seeing deer. We saw bucks. Lots of them. But there was this one particular stud that kept his distance. I could see him, but he was to our left and didn’t move much, so my dad couldn’t. I watched him through the binoculars for at least 20 minutes, but I never could tell much about him, except that he sported a typical frame with tall tines. It didn’t take long, though, for him to make his way closer and into full view. The big 10 point was still carrying a good bit of velvet, so I couldn’t know for sure just how big he was. All I knew was that he was huge and was coming in fast. I motioned for my dad to look that way, but he still couldn’t see him. As the big boy ran in from our left, I got my first good look and knew he was the one I was after. He came in hard and fast and then made a sudden stop and turned to head back out. Before he could leave the scene, I put a 130 grain ballistic tip from the .270 into him and watched him run off. As patient as we had been so far, this all happened so quickly. My dad still hadn’t had a chance to tell much about the deer I’d just shot. But once we laid our hands on him, we both knew – I’d just shot the deer of a lifetime. My main frame ten grossed 179 2/8″ and weighed 287 pounds. He sports a split G2 and more than 40″ of mass. The buck of a lifetime. The weekend didn’t end there. All of our hunters killed big bucks and left with memories that will (hopefully) never fade. We enjoyed great food, great company, and the great outdoors. The time spent with friends and family on this trip was more valuable than any deer I could’ve taken – and what a wonderful place to escape the day to day and clear your head, which is exactly why we went. And the place was well worth the travel. Brian and Mark are first class guys that will put you on ’em. Hunting at Rhino Hunt Club is nothing like hunting at home – and that’s a good thing. And while I’ll never give up my south Georgia peanut fields and pine trees, I can’t wait to make it back to Custer, Michigan and experience all that Rhino has to offer once again. 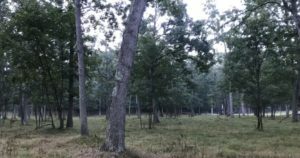 Those interested in chasing the buck of a lifetime can check the place out for yourself at www.rhinohuntclub.com or on facebook.